The power of Xtend IVR resides in its scripting language which is simple to learn, flexible and easy to code. Complex telephony operations like call transfer, speech recognition etc. can be coded in just a couple of lines of script. Xtend IVR implements a driver model for interfacing with voice devices. This enables Xtend IVR to support practically any voice device in the market. Xtend IVR is the only toolkit in the market with extensive support for multiple voice devices. Supported devices include PIKA, Ocha, Synway, Donjin, SIP, NMS, Diva Server, Ai-Logix, H.323, Dialogic, TAPI, Sangoma etc. Additional voice devices are being supported on an ongoing basis, depending on customer requests and device availability. Xtend IVR provides database functions to access SQL Server, DB2, Oracle, Sybase, Access and other standard databases via ADO and ODBC. In most cases, SQL statements can be directly invoked from inside the script to obtain the required data. Advanced database functionality can be implemented by interfacing to any of the supported languages. Xtend IVR works right from a single port voice device to a 4000+ port T1/E1 solution with no changes in code. This means that when coding for a single port IVR, if the developer extends multi-thread support, then the same can be deployed for a 4000 port IVR or above. Xtend IVR also supports clustering of systems to provide for higher port densities of 4000+ ports and to provide for fail-over/redundant backup. Support of all Speech API 4.x and 5.x compatible engines for Text to Speech. UT8 string are supported for TTS enabling support of foreign language speech engines. All Speech API 5.x engines are supported for Speech Recognition. Ability to dynamically create and load multiple recognition grammars. Ability to perform speech cut-through on complete recognition of sentence, on recognition of the first word and in presence of speech. The scripting language is designed from ground up for easy multi-language prompt support and enables the user to implement IVR support for multiple languages quickly. The innovative number to speech technology enables numbers, dates etc. to be spoken out in English, Hindi or Malayalam. Xtend IVR has the capability to change the logo bitmap and also set the messages that appear in the window title and its about dialog box so as to facilitate developer customisation. Xtend IVR supports advanced features like background play, real-time mixing, voice logging, conferencing and faxing capability that enables one to provide superior voice and fax solutions with minimal effort. Support for general purpose ports to implement additional functionality not directly related to, but playing a supporting role to the IVR. For e.g. polling a serial device every 10 seconds or for retrieving mail every 3 minutes etc. These general purpose ports run the same scripting language, enabling one to quickly implement background tasks. Support for multimedia devices for streaming audio to multiple channels. For e.g. the input of the sound card mic can be taken and provided to all callers who dial into the system. Such an implementation could be used for providing a real-time radio / music channel service to callers. Support for HTTP, FTP, SMTP and POP3 protocols enable you to obtain information from the web, download files, send and retrieve mail directly using the scripting language. The newer protocols like web services and RSS (samples included) are supported by interfacing with a next generation language like C#. Xtend IVR supports a plugin interface to enable easy extensions to its scripting language. This permits implementation of additional functionality if such customisation is required. For example, the inbuilt database functionality and SMTP/POP3 access is implemented as plugins. Xtend IVR supports compiled scripts, so that end user modification of script files can be prevented. To prevent any sort of tampering, Xtend IVR scripts are tokenised, encrypted and check-summed. 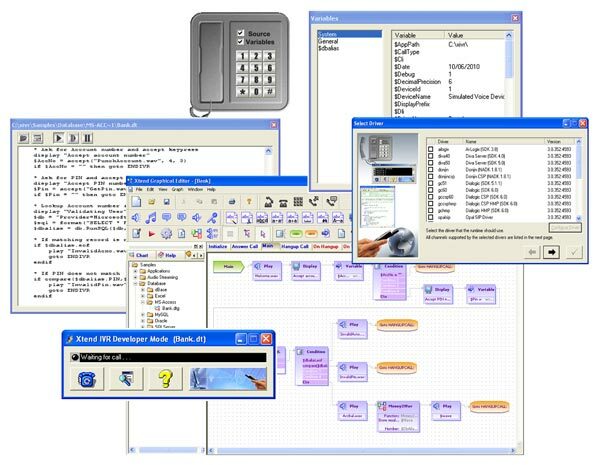 Unlike a conventional development environment which requires the use of two phone lines to test and debug the IVR prompts, the Xtend IVR Developer Edition simulates an incoming call in software which allows the IVR development to be done on any multimedia system. In fact the developer edition is completely free for you to try out and can be downloaded from here. Supports the ability to send and receive SMS messages via a standard GSM modem. Comprehensive support for Unicode text, long sms and Flash messages are also present. SMS support is available as a separate software pack that must be purchased independently.